Houten, The Netherlands, 24 May 2017 - The cost of a mobile SIM-only plan showed a general decline in most countries in Western Europe in Q1 2017, according to the latest research by Telecompaper. The annual comparison of mobile prices across 16 countries shows a general trend of operators including more and more data in postpaid plans, as well as many already offering a roaming allowance ahead of the change in EU rules in June. In the survey of nearly 1,600 plans available on the market, the Telecompaper EU Benchmark report found that Denmark remains the cheapest place for a mobile plan and Greece the most expensive. The study looks at the total cost of mobile plans (TCO), both with and without a high-end smartphone, and compares the lowest and median prices on offer. Denmark was the only country with cheap prices in all comparisons, while France, Finland, Italy, the Netherlands, Sweden and the UK fall into the range of mostly cheap countries, with their median TCOs falling below the median of the 16 counties in most categories. In contrast Greece and Portugal remain generally the most expensive. Compared to a year ago, Italy has become cheaper, while Switzerland is expensive for sim-only offerings but much less so when including a high-end device. Finland, Sweden and Norway have become slightly more expensive, as last year they all had prices below or equal to the TP16 median and now they show at least one or two ranges of plan above the TP16 median. Variable performances were recorded for Austria, Belgium, Germany, Ireland, Norway and Spain, with some types of plan cheaper than the median and some more expensive, depending on the amount of minutes and data included. 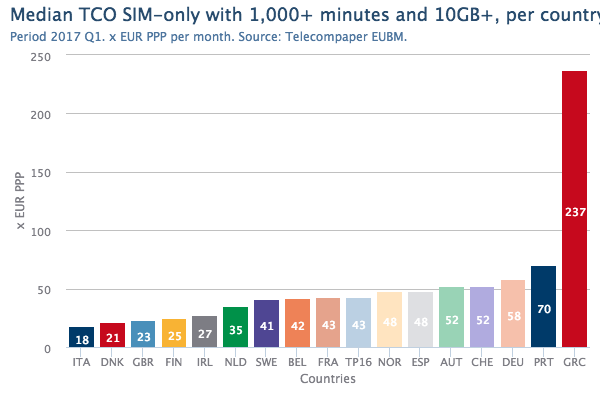 Looking at one of the most common plans across the 16 countries, of 1,000+ minutes and more than 10GB+ per month on Sim-only, the research found a small drop in price, to a median total cost per month of EUR 43 in Q1 2017, down 4 percent from a year earlier. Italy, with a median cost of EUR 18 for this type of plan, was the cheapest country, due to a new offer by operator 3. Denmark and Finland also remained cheap for this combination (resp. EUR 21 and EUR 25), and the UK joined the group of low-cost countries, with a median price of EUR 23 per month. The Netherlands also showed again a TCO (EUR 35) well below the TP16 median (EUR 43). Greece continues to have the highest median TCO (EUR 237), which is largely unchanged compared to Q1 2016 due to just one expensive plan in this range, followed again by Portugal (EUR 70, slightly lower). With the rising smartphone penetration and availability of 4G networks, data has become more important in the operators’ propositions in all European countries. In most countries there was an increase in the share of plans offering more than 2GB per month, while at the same time a decline in the number of countries where consumers can buy a plan without data (four countries compared to seven last year). However, the differences between the various countries remain large. In Denmark and Finland for example, it isn’t possible to subscribe to a plan with less than 5GB of data, unless one chooses no data in Finland. In many countries the share of plans with at least 5GB of data increased significantly. Ireland showed the biggest growth, with 63 percent of plans offering more than 10 GB of data compared to just 28 percent in Q1 2016. Furthermore, several countries now have unlimited data plans. Finland already showed most plans as unlimited in Q1 2016, and there were some on offer then in Ireland and Switzerland, but in Q1 2017 we also find plans with unlimited data in the Netherlands and Germany. “We expect this trend towards unlimited data to continue, following recent announcements by Tele2 and T-Mobile of such offers in several countries,” said Marion ter Welle, Telecompaper senior analyst and co-author of the report. “Offering unlimited data should help operators offset some of the downward pressure on prices and help convince consumers to migrate to higher-priced offers “. In addition to looking at the total cost of mobile postpaid plans, the report assesses some of the most common value-added services included. The latest survey shows an increasing number of operators including (some) free roaming in the EU, ahead of the implementation of the EU roam-like–home regulation from mid-June 2017. Over a third (33%) of plans included EU usage/roaming, up from 22 percent in Q1 2016. “By our next report all plans should include roam-like-home in the EU. This may help restore some pricing power for operators, as the perceived ‘extra’ service supports small, incremental price increases,” said Alejandra van de Roer, Telecompaper senior analyst and co-author of the report. The analysis is based on available subscription plans from all MNOs in the 16 European countries and most of the MNO-owned sub-brands. All in all, this led us to compare almost 1,600 plans from 71 operators in 16 countries. Comparing the total cost of ownership (TCO) is central to our approach, in order to include all elements constituting the cost of consumer communications. The (hidden) cost of a handset is among the most important aspects that need to be included in the TCO. In this edition we have focused on one type of handset, a top-range smartphone (Samsung Galaxy S7), as well as the Sim-only plans. The TCO also incorporates all monthly subscription or connection costs, promotional discounts and corrections for differences in purchasing power across the 16 countries. In addition to the median TCO, the report also analyses the lowest available price plans. The report provides a detailed comparison of mobile pricing across Europe. To allow readers a closer look at the data, our pricing database is available for purchase separately. The 'EU Benchmark Q1 2017' report provides data and analysis of the high-end smartphone and Sim-only choices. The full report is available for business users for EUR 4,900. Corporate users pay EUR 6,900, which includes the pricing database and plan details.